A water baby is NOT caused by the dam drinking too much water. Pregnant dams need lots of water, as the amniotic fluid is constantly changing. Water babies are like babies that become anemic (low blood) in utero. They get severely edematous. This is usually due to parvovirus or an immune response (blood group incompatibility). Image of a newborn water puppy— MistyTrails plays "midwoof" to many local breeders. Edema:an abnormal accumulation of serous fluid in various organs, cavities, or tissues of the body. We can learn a bit from "people" medicine—water babies (hydrops) usually occurs from lack of red blood cells in the baby as a result of an infection or immune reaction. It can affect only one pup in a litter or the entire litter. Water puppies are impossible to deliver naturally, as they are huge, swollen, waterlogged puppies. A C-section is a must, as these puppies are generally two to four times the size of their littermates. These pups range from mild, medium to severely affected. They do not get STUCK in the birth canal; they do not get that far, as they block the birth canal. If your dam is pushing on a single puppy, has contractions for two hours without puppy presentation into the birth canal, especially after delivering one or two normal pups, you should seek veterinary assistance, as the remaining pups can die along with the dam. There are many opinions on why these water pups develop; some say it is congenital or environmental, some say diet, trauma to the dam, or even a virus. There is no evidence to show it is hereditary, but it does affect some breeds more than others, especially the Bulldog and flat-faced breeds including Boston Terriers, English Bulldogs, French Bulldogs, Shar Pei, Bullmastiff, Basset Hound, Chow Chow, Wire Fox Terrier, West Highland White Terriers, Cavalier King Charles Spaniels and Pugs. It has also occurred in crossbred dogs and pedigree dogs, such as Borzoi, Maltese, Labrador Retriever, Schnauzers, Bichon Frise, Chihuahuas, German Shepherd, Old English Sheepdog (Bobtail), Poodle, Great Dane, German Pointer, Cocker Spaniel and in a wolf from zoo/wildlife-park. The condition is also occasionally seen in other dog breeds. An x-ray does not always show the larger size of these puppies, as the weight is mostly fluid. An ultrasound is thought to detect these puppies. Water pups are usually born alive, limp and weak, and they look like someone blew them up like a balloon. 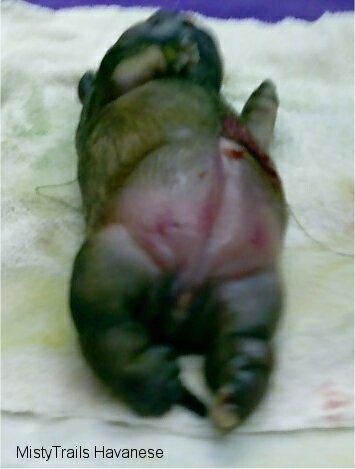 The dam was supplying the needed oxygen and nutrition through the placenta and cord, but soon after birth the medium to severely affected pup will suffocate by the pressure of the fluid. Some people report the mildly affected pups that survive the first two to three days turned out to be normal pups. Others say there were other underlying problems and their water pups died within the first week. The choice to try and save or to let the pup go without suffering will be between you and your vet, how much experience you have behind you, and if you are willing to put in the time PLUS be prepared for heartache. Trying to save these pups at this time is considered experimental. The cause and treatment of this condition are unknown at this time. Treatment needs to be given right away for a mildly affected pup. Elevate the head and extend the neck for a more clear airway. To encourage urination, run one or two fingers over the genitalia. Some veterinarians have recently had great success using Lasix in saving water puppies. Lasix is the brand name of the chemical furosemide. Furosemide is a diuretic-saluretic, which inhibits the re-absorption of sodium (salt). The drug is administered intravenously immediately after birth of the water puppy. Administer furosemide (Lasix) .1 to .2 mL intramuscularly to increase urination, this can be repeated every 30 to 45 minutes for three injections. Caution: more than three could cause dehydration. Keep the pups warm and stimulate urination as described above every –two to three minutes. Elastic bandages have also been used to push out fluid (not too tight). Mildly affected pups can take one to two hours to breathe normally. Moderately affected pups take 90 minutes to four hours to breathe normally. Medium to severely affected pups are difficult to save; they usually drown within 30 minutes. Severely bloated pups have been known to split open at the abdomen just from handling. Autopsies have shown that the organs are saturated in fluid and the life sustaining organs cannot function, causing the pups to drown. An inuterine reaction to sodium, or an inability to process proteins. Hypothyrodism, as well as an inability of the lymphmatic system to drain effectively due to the anatomy. None of these ideas have ever been proven. Water puppies are often seen associated with a combination of vertebral column defects and often have further abnormalities, particularly cleft palates. A traumatic origin (with disruption of the placenta) as a fetus suffering from anasarca is usually the sole occupant of a uterine horn filled with a large amount of hemorrhagic fluid. Could be caused by a virus, it has been attributed to the after-effects of the mother's oronasal infection with the minute virus during the last trimester of pregnancy associated with myocarditis. In the latter case, elasticity of the fetus' skin allows extravasation of transudate that is compensated for by the immediate supply of fluid via the umbilical cord. Congenital anasarca—There is no possible treatment for puppies suffering from congenital anasarca. These puppies usually die within less than 36 hours. According to doctors, human babies can be born with this too. In humans, edema is considered a congenital syndrome that happens in utero, and doctors figure it is most often caused by a virus (slap cheek virus, and a human parvo-type virus B-19) or it can be caused by a liver malfunction. In the U.S.: Widely varying figures have been quoted, but one case per 600-4,000 pregnancies is the estimated frequency. Figures from Thailand suggest an estimated incidence of one case per 500-1,500 pregnancies. It is not a labor-induced issue, it happens prenatally for unknown reasons. There is a genetic syndrome that will cause swelling, including chromosomal abnormalities and one called Turner’s syndrome in which babies rarely make term, and have dwarfism, shorter bodies, and extra neck skin. There are photos of dwarf looking puppies that may fall into this category. If you suspect your dam may deliver water puppies consult your vet. A big thank-you to the breeders who shared their stories on their experience with water puppies. If you have additional information/ photos on water puppies you would like to share in order to help others with this issue, Contact Us.